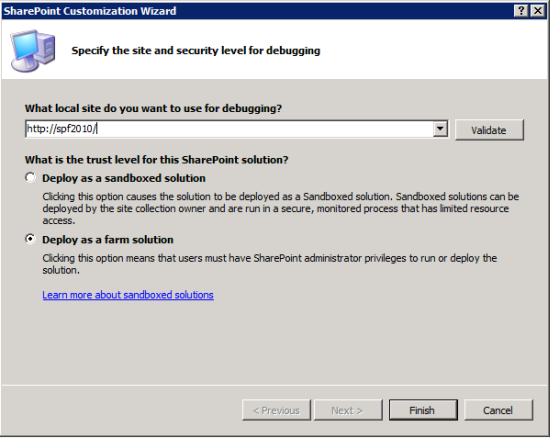 After you deploy the BotDetect SharePoint CAPTCHA Feature to your SharePoint farm and activate it in a SharePoint web application, it will automatically add all of the necessary configuration to the web application's web.config that are required in order for the BotDetect Captcha control to work in a SharePoint site. This means that after activating the feature you can easily create your own web parts and application pages that utilize BotDetect Captcha protection in that farm. 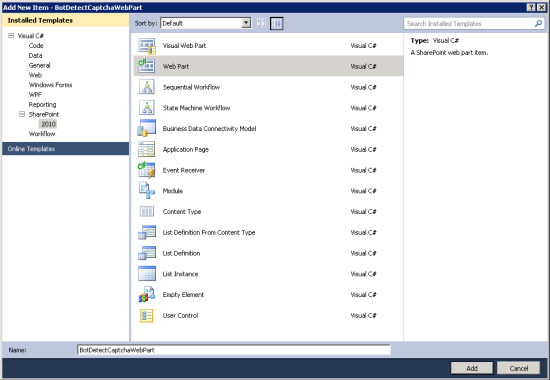 These are the steps required to create a simple SharePoint 2010 WebPart which displays a Captcha test and checks that user input matches the displayed Captcha code. We will use C#, but please keep in mind that equivalent VB.NET code is very similar. The Source Code of the Webpart described on this page is available for download here. Right-click your project from the Visual Studio Solution Explorer and select References → Add reference, then Browse to the BotDetect Captcha installation folder. 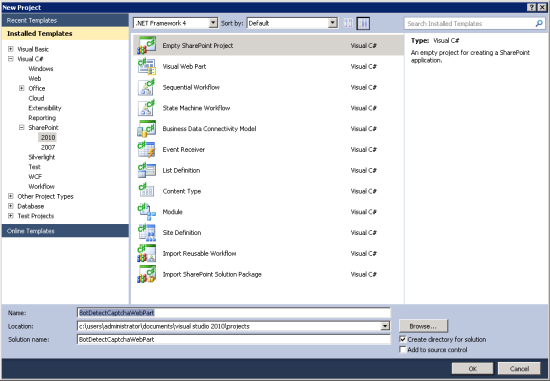 Note: There is no need to configure the deployment behavior for the BotDetect assembly because it was deployed with the BotDetect SharePoint CAPTCHA Feature. When the Validate button is clicked and the form is submitted, user input is compared to the code displayed in the Captcha image. In this simplified example, we just display the Captcha validation result. In a real-world scenario, the protected action (user registration, comment posting, email sending...) would only be performed if the Captcha test was passed.